Front Line Defenders celebrates the release of the three members of the “Tlanixco 6” who have remained imprisoned for the past 16 years until 5 April 2019, including after the release of political prisoners earlier this year. After more than 15 years of unjust imprisonment, human rights defenders Pedro Sánchez Berriozábal, Rómulo Arias Mireles y Teófilo Pérez González, who worked to guarantee the Tlanixco indigenous community’s access to water, were able to safely return to their communities. 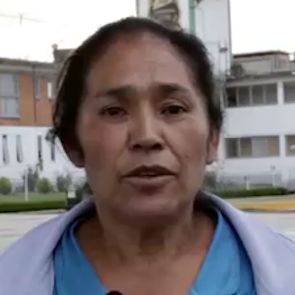 Dominga González Martínez, Lorenzo Sánchez Berriozabal and Marco Antonio Pérez González were freed on 20 February 2019. While celebrating such long-awaited releases, which put an end to a blatant case of mismanagement of justice, Front Line Defenders remains concerned at the challenges faced by the AMLO government in addressing pressing issues regarding the protection human rights defenders. In a recent visit to Mexico, the UN High Commissioner for Human Rights Michelle Bachelet compared the deadly toll of Mexico’s rampant gangland violence to the thousands who died or disappeared during Chile’s military dictatorship, adding that Mexico faces a serious problem regarding the lack of implementation of their already existent laws for the protection of human rights. Despite the introduction of much vaunted reforms during the Felipe Calderón presidency and during the term of his successor, Enrique Peña Nieto, in the last decade the situation of human rights defenders in Mexico has been marked by violence and the progressive criminalisation of social protests. The Inter American Commission on Human Rights (IACHR) has acknowledged the significant reforms introduced since 2011, including Constitutional amendments and the recent approval of protocols to investigate cases of torture and enforced disappearance. Notwithstanding such progress, it noted that the implementation of new legal standards has been hampered by institutional deficiencies. Human rights defenders in Mexico point out to lack of access to justice and widespread impunity as main sources of concern. Human rights defenders and journalists face intimidation, legal harassment, arbitrary detention, death threats, physical attacks, enforced disappearances and killings as reprisals for their legitimate activities in defence of human rights. Vulnerable groups include journalists, LGBTI, environmental, indigenous, migrant, and women’s rights defenders. Indigenous peoples’ rights defenders are particularly vulnerable to criminalisation, imprisonment, defamation, and killings. Front Line Defenders’ Global Analysis 2018 documents 48 cases of killing of human rights defenders in Mexico, which remains one of the countries with the highest numbers of killings of HRDs worldwide. So far, in 2019, the organisation has documented the killing of 13 HRDs. Disappearances are endemic, and often happen with the collusion of the State. Front Line Defenders calls on the national authorities to make effective and expedite efforts to resolve the Ayotizanpa case and the thousands of cases of enforced disappearance. Environmental rights defenders are particularly targeted through criminalisation, in cases where the State’s justice system is used as a tool to silence human rights defenders. The case of Pablo López Alavez, arbitrarily imprisoned since 2010, raises concerns for the lack of due process guarantees and access to the justice system, including the right to full answer and defence, by human rights defenders. On 9 April 2019, an international campaign was launched for his immediate and unconditional release. Front Line Defenders remains concerned about his case and the numerous other cases of human rights defenders imprisoned and criminalised. In addition to carrying out actions to guarantee the protection of particular cases of defenders, the Mexican Government must make efforts to create a more favourable context for the defence of human rights. One example is the Regional Agreement on Access to Information, Public Participation and Justice in Environmental Matters in Latin America and the Caribbean, which has been signed but is still waiting for the Mexican Government to take measures to ratify and implement it. The Escazú Agreement represents a first and crucial step in the protection of defenders of environmental rights. Front Line Defenders urges the Mexican authorities to put an end to the patterns of intimidation, criminalization and killings against human rights defenders. Front Line Defenders considers the release of Pedro Sánchez Berriozábal, Rómulo Arias Mireles and Teófilo Pérez González as a step towards redressing the patters of criminalisation and repression against those who work towards the implementation of human rights and calls on the government to free Pablo López Alavez and the defenders who remain criminalized.